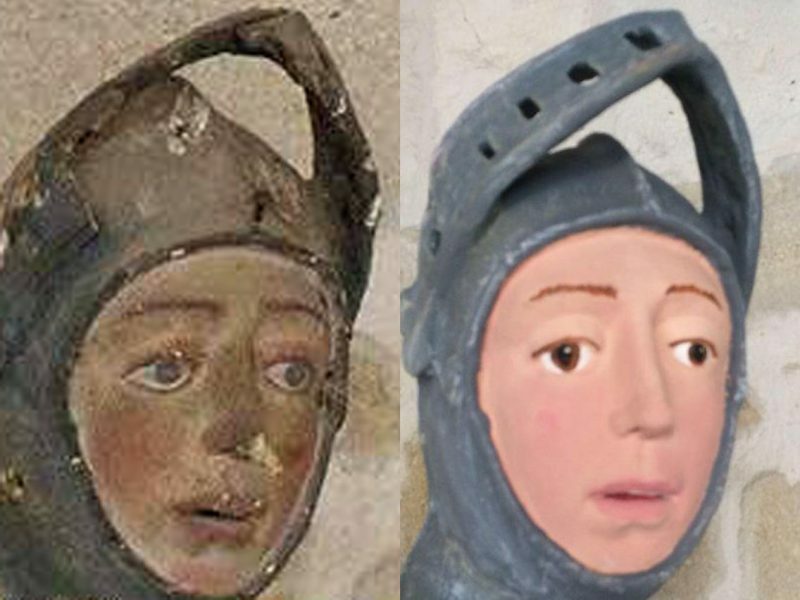 Spanish history was given a modern twist last week when a wooden effigy of St. George was restored in a unique and calamitous way by a local teacher. The sculpture is located at the Church of St. Michael in Estella, a town in Navarre, northern Spain. It received a daubing of bright color better suited to Walt Disney than a sacred relic. No-one is quite sure how the precious item could have ended up in the hands of an amateur, but there’s no mistaking the bizarre result. The council is furious, with town mayor Koldo Leoz far from impressed. Mayor Leoz let The Guardian know in no uncertain terms about his frustration. The amusing artistic interpretation has naturally gone viral. The work was undertaken by a handicrafts teacher, whose expertise was clearly far removed from the qualifications necessary to complete the important task. This educator came on the scene at the request of parish authorities, so this wasn’t so much a case of divine intervention as an unholy lightning bolt. 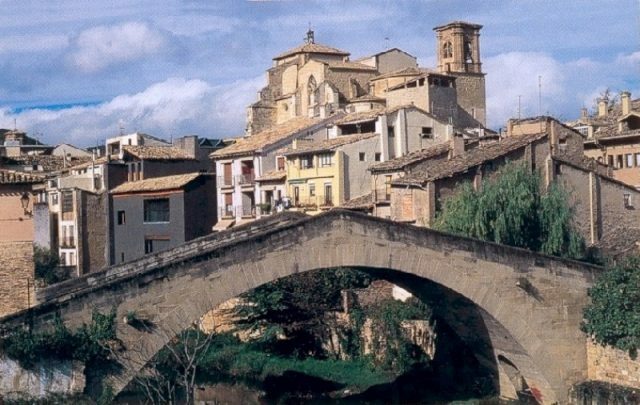 As far as Spain’s cultural heritage goes, this is another embarrassing setback. In 2016 another piece of religious significance was ruined by a well-meaning believer. Cecilia Giménez, a pensioner in the town of Borja in Aragon, north-east Spain, entered the Santuario de la Misericordia with the aim of sprucing up a fresco. 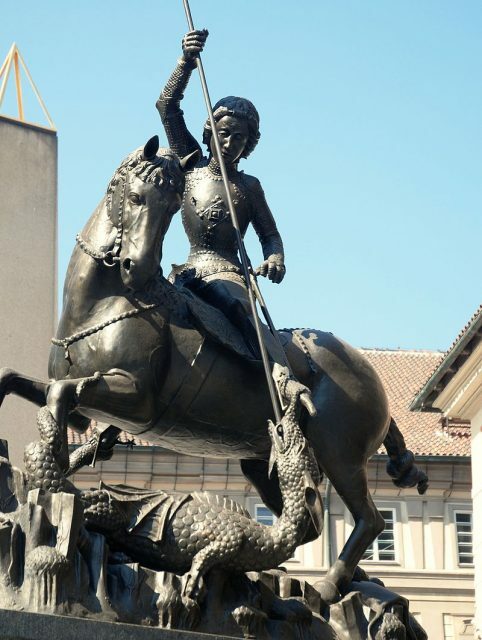 Looking down on her from the wall was something that went beyond the hallowed likes of St George. 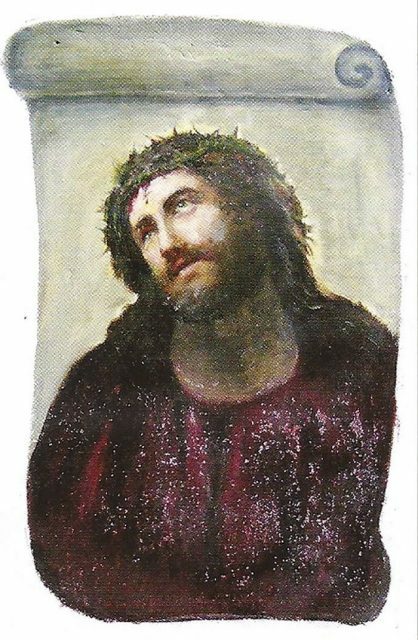 The fresco depicted Our Lord Jesus Christ, and Giménez thought her palette could give the Son of God a worthy makeover. It was created by the Spanish painter Elías García Martínez, who passed away in 1934. Art lovers may have thought it a blessing that he never lived to see the transformation. 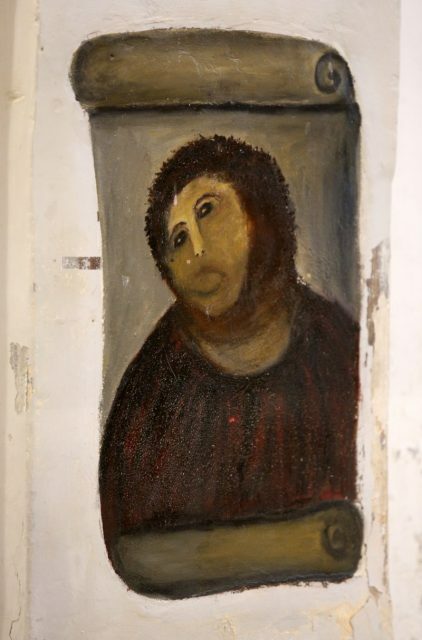 The original title was Ecce Homo, Latin for ‘Behold The Man.’ Following the restoration, it was given a new title: ‘Monkey Christ.’ The thorns and scourged expression of Jesus were replaced with what resembled a furry helmet and simian features, bearing a pair of cold, black eyes. While the Mayor of Estella waits to hear if the effigy of St George can be saved, there is a happier ending to the story of Ecce Homo. The source painting from which the fresco was derived is back in town, courtesy of a local antiques dealer. Tourism enjoyed a boost because of the elderly brush-wielders hilarious misjudgment, which traveled worldwide via the web. Religious leaders may not share this sentiment, but perhaps God Himself played a hand in the strange turn of events. He works in mysterious ways, and this way was certainly more mysterious than most.